Designer American Turquoise Jewelry Making and Beading Supplies for your Unique Creations! 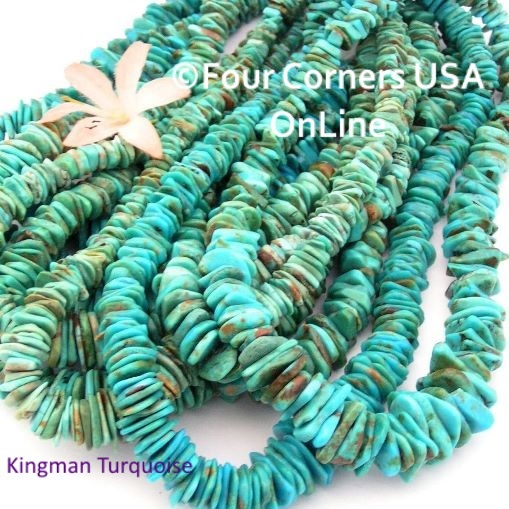 Various selections of sizes including Heishi, Rounds and Rondelles are available in many shades of Arizona Kingman Turquoise Blues and Greens. We also have a selection of Mohave Green (match Gaspeite) and Mohave Purple (match Purple Spiny Oyster Shell or Sugilite) combined with renewable Organic Apple Coral (match Orange Red Spiny Oyster Shell) to compliment all your Southwestern Designs made with American Turquoise from USA Turquoise Mines!